We offer a return to base repair facility for tape drives and UPS’s. All our repairs come with a 6 month warranty and on the rare occasions when we cannot repair your unit there will be no charges for evaluation. 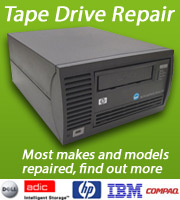 Our tape drive repairs include all spares (including heads) and the price you are quoted is the price you will pay. All our repairs are tested to the highest standard using the Manufacturers software and diagnostic tools. We find this the most cost effective way of repair because it means you only pay for what is wrong with the UPS. Please contact sales who will be pleased to submit a repair quotation/price list. Backing up your data is critical and we understand that you may require an urgent fix for your back up device. We are able to offer an onsite repair service for the majority of tape drives, autoloaders and libraries. Where possible we will always bring an exchange/loan unit with us to site to ensure that a fix is achieved so that the customer is able to complete a backup. Depending on the location we can offer a fixed call out charge with normally includes the first hour on site. Any time after that is charged on an hourly rate. Castle Computers can also provide continuous support for your tape storage equipment and offer a range of support contracts. An advance exchange service is available for a wide range of equipment and we are able to send a working product to site for a next day delivery. We then allow up to 2 weeks for the customer to return the faulty part. Using this service gives the customer the benefit of a fast delivery and the cost saving against buying a replacement.